Founded and developed by Ken Bakst, the 1997 USGA Mid-Amateur Champion, Friar’s Head is situated among the pristine sand dunes of Baiting Hollow, on the North Shore of New York’s Long Island. The course was designed by Bill Coore and Ben Crenshaw, who were first introduced to the property in 1997, shortly after the opening of their game-changing project at Sand Hills. As with Sand Hills, the pair did not rush their design at Friar’s Head, preferring to take their time considering the various routing options. Unlike those endless rolling hills in Nebraska, this particular site featured both heaving dunes and a flatter tract of farming ground. Finding a way to link these contrasting landforms together was crucial to the course’s success. With great skill, the design team was able to devise a circulation pattern that ebbs and flows effortlessly between the sand and softer ground, with minimal earthworks required to build the holes and, importantly, short walks between greens and tees. Perhaps even more critical than a genius routing plan was a strong working relationship with founder and Managing Member Bakst. Passionate and resolute about his development, Bakst made a deal with Coore and Crenshaw that he would express his views and opinions on all golfing matters, but ultimately leave the final decisions to them. On almost every level, Friar’s Head is near flawless and the designers credit their client for his unwavering support and for specific ideas that helped them to create this modern masterpiece. For a visiting golfer, your first look at Friar’s Head can overwhelm. The sight of glorious white sand, giant dune ridges and panoramic sea views all greet you from the clubhouse and whet the appetite for the day’s golf ahead. Although much of the course is then arranged across the lower farmlands, Coore and Crenshaw’s holes are so stylishly shaped that golf through the flatter areas rivals that available on the more dramatic terrain. Certainly the lowland holes are strategic equals, and arguably feature the most impressive green complexes on the property. The last hundred yards on each of the 2nd, 4th, 5th, 11th and 13th are outstanding. As is the fairway bunkering on the longer transitional holes. Golf at Friar’s Head is all about the sand, however, and it’s the holes routed around the property’s most dominant ridge that steal most of the headlines. 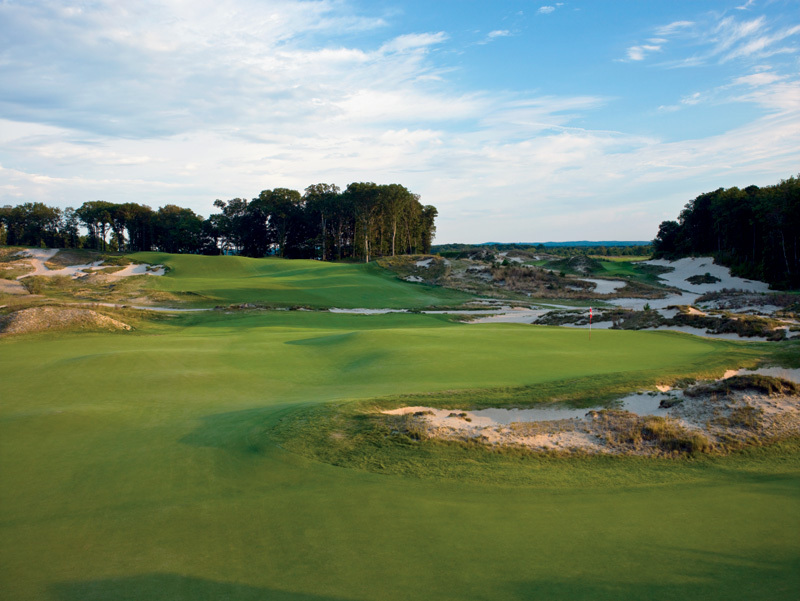 The par four opener is quite an introduction, its fairway cut by sandy scrub and rising sharply into a blind putting surface atop a 25-foot hill. The adjacent 9th is equally eye-catching as it tumbles back down the bank and bends toward a beautiful green site fashioned from a stretch of exposed sand. In between is an impressive collection of eclectic yet coherent adventures, from half-par highlights like the 4th and 5th to option-laden masterstrokes like the par five 2nd and cape-style 6th. 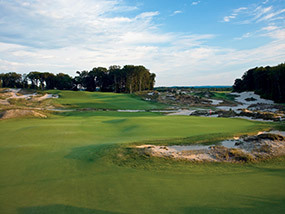 Onto the back nine, and the homeward run starts with a unique par three set amongst the sand that measures anything from 110 to 235 yards, depending on the tees and where the flag is located on its enormous green. 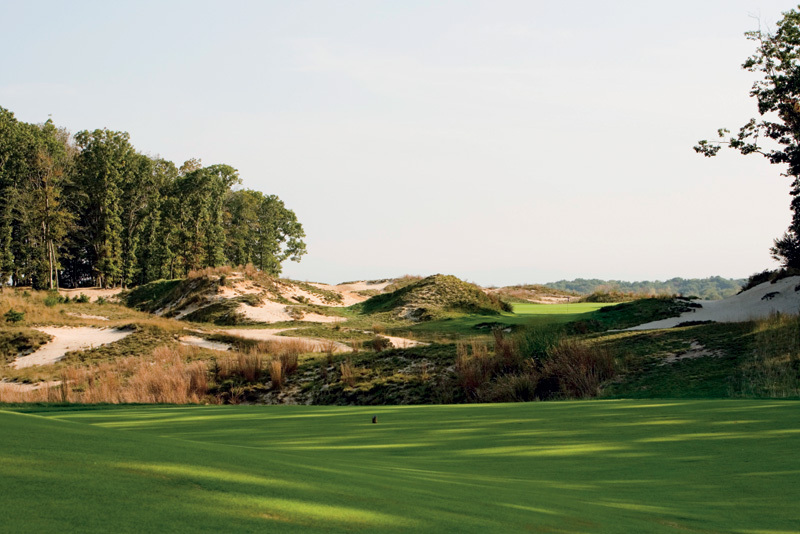 Other inward holes of note include the brilliant par five 14th, which slowly rises through forested dunes toward a steeply pitched green nestled beneath converging ridges. 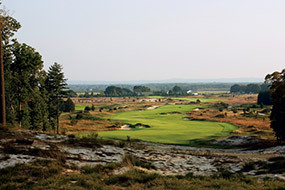 The next is equally spectacular, and drops from an elevated tee through a natural valley toward the Long Island Sound. Like at Sand Hills, the closing run includes a sinister short par three 17th hole, with a green about a fifth the size of the 10th, and a strong par four finisher that bends around the shoulder of a giant hill. As good as the individual holes are at Friar’s Head, the lasting impression for those fortunate enough to play here is a golf course of great balance, great diversity and great continuity. Aiding that continuity are free form teeing grounds, which flow elegantly between previous green and following fairway and were actually added by the designers post-opening. Other noteworthy modifications over the years include the removal of trees on the outward nine, to expose more sand around the 7th and 8th holes, and the softening of steeper putting contours on the 7th and 14th greens. Impressive for a club so young and so highly regarded, is this appetite shown for continual improvement. 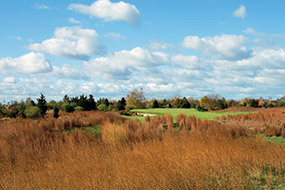 The fact an elevated boardwalk with breathtaking views across the Long Island Sound to Connecticut was added in 2010 to take golfers from the 15th green to the 16th tee emphasizes the value placed by Bakst and his team on the total member experience. Coore and Crenshaw have built an awesome reputation over the past two decades and their work here is further proof of both their talent for working with superb golf land, but more importantly of their ability to shape disparate landforms into memorable golf. It may not be the easiest course to get on, or the most affordable place to play, but in the modern market Friar’s Head has few peers.